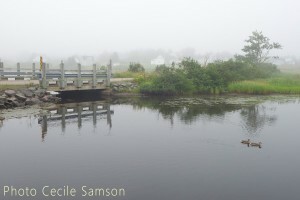 L’Ardoise – Living on the southeast shore of Cape Breton Island, fog is something that often hangs around, sometimes for days on end, but some say it’s all part of the maritime charm. I have to agree, even more so on those hot summer days where the heat of the sun is unbearable, one can escape it all and head for a cooler patch along this coastline. I might add it can also give a wonderful moody and serene look to a photo.